Today’s Bungubox ink is June Bride Something Blue. Thanks to Pen Chalet for sending a sample over for review. I’ve looked at this color online a million times, and I finally got around to trying it. 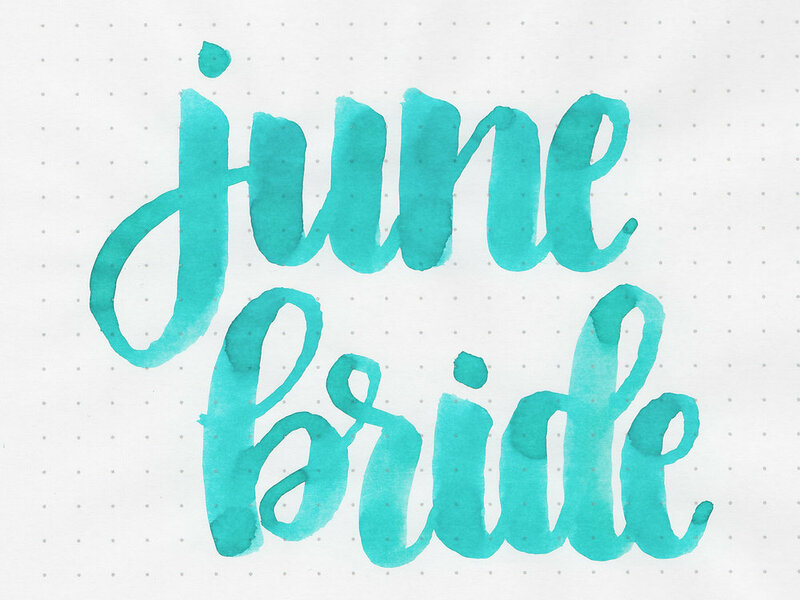 June Bride is a beautiful turquoise blue. Ink large swabs there is some pretty shading but no sheen. On Staples 24 lb copy paper there was a little bit of feathering, and just a tiny bit of bleeding. June Bride has less green than Water Source Marche, but more than Torquay. Click here to see the Bungubox inks together. I used a broad Pelikan M600 Turquoise on Tomoe River 68gsm. The ink had an average flow. Overall, I really love this blue. It’s a gorgeous color, well behaved, and even shows a little bit of shading.